Flasks are generally meant to be used with a certain degree of stealth in mind. Classically used to carry booze into places where booze isn’t supposed to be carried into, flasks provide a way to sneak a sip without drawing attention to oneself. Fill with whiskey or vodka and enjoy as needed. For those who like to boldly proclaim their drink of choice, the True Fabrications 6-Ounce Acrylic Flask provides the means. 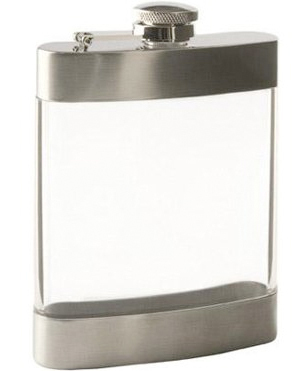 The 3-inch by 5-inch by 1-inch flask mimics what any other flask is capable of, but does so with a see-through acrylic body. If asked, just remember: whiskey looks like iced tea and vodka is as clear as water. Jagermeister? You are on your own.